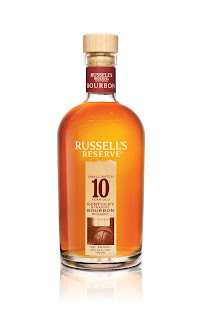 The Coopered Tot: Russell's Reserve hits the nerve... with verve. "Russell's Reserve is also a really good small batch bourbon. Definitely still has the distinctive WT yeastiness to it, but mellowed in comparison to the younger versions. And I think it's usually under $30, so it's even a decent value." And so it is. A full review of Russell's Reserve 10 will follow shortly (and a lovely bottle of it was just generously supplied by the lovely Danielle of Exposure). So, why is Russell's Reserve bourbon suddenly so present in the whiskey Zeitgeist? "For any Wild Turkey whiskey, 110° is just about barrel proof because they have an unusually low barrel entry proof." If you read Sku's Recent Eats last Tuesday you just read a post about how rare high proof bourbons are. Beam has had a premium one since Booker's. Wild Turkey's is Rare Breed. A nice sip, but not really a high end bourbon. (Whisky geeks, please remember that Booker's is "small batch and this new Russell's is "Single Barrel"). So this is a fairly major addition to our pantheon of barrel strength bourbon. #4 Char barrels for that lovely richness of deeply charred oak. Now all that sounds pretty good to me. Maybe enough to forget about the fact that there's no age statement on the bottle. Chuck and others have complained that the more mainstream Russell's Reserve 45% abv. sports a nice mature 10 year age statement for $35 - so it seems disappointing to them that the more expensive ($50) Single Barrel version lacks an age statement. I would point out that Four Roses Single Barrel also lacks an age statement and Jim Rutledge has eloquent reasons for why this is better. These have to do with individual barrel selection for flavor rather than a blanket subjugation of flavor by a dogmatic age statement label. Under the circumstances I'm in favor of giving Jimmy & Eddie Russell the benefit of the doubt on this one. Lord knows they have made plenty of good decisions before. The proof will come in the tasting in any case. Keep your eyes peeled for this one. This might be a lovely addition to the canon. (Note - this post has got a lot of action in the Comments - with a lot of good material coming out there. Be sure to click the comments link and check them out). Glad to hear you enjoyed it. That's why I don't understand the creeping prices of new bourbon releases. There's so much good stuff available for $35 or less that it's really hard to get value out of many bourbons that are over $40. Hopefully a local bar will get a bottle in soon and I can see for myself, though. I think the creeping prices are the supply/demand equation in the midst of the bourbon boom. It's why you can't get Pappy or BTAC releases (OK - some people can get them, just not me here in NYC). The other day I was at Astor Place Wines and a nice young lady came in with a note from her boss. "Do you have 'Pappy Van Winkle'?" She asked. The staff laughed nervously and explained that it's sold only via a list which is booked years in advance with a long waiting list to get on the list - and then only via a fall release. I steered her towards the Parker's Heritage (as a mature high end wheater). This kind of thing leads all bourbon distillers to push higher end products to get a piece of this pie from Brown Foreman's Old Forester Birthday editions to the new Bulleit 10. In much of the market the divide is between "small batch" (whatever that means) and "single barrel" (which we all know what that means). Look at Willet's bourbon. The small batch is nice. The single barrel is frequently superb. (granted these are curated selections from other distilleries - mainly, supposedly, Heaven Hill). So the purpose is to ride the rising curve of prices. The introduction of premium brands is a way of cost justifying this to consumers. Is it a value proposition for us? Only if the bourbon is better. That remains to be seen here. I love Wild Turkey because their low end is near the top of the cheap bourbon pile in terms of quality. It's cheap and you can get it anywhere and it's damned fine sipping whisky. I also love the Wild Turkey single barrel (Kentucky Spirit) for personal reasons - but grant it's not a great value price wise. WT hasn't had a bourbon that challenges the real high end (like Four Roses LE editions, or BTAC) - yet. But they must have some great casks out there, right. Simple bell curve distribution. Their production is massive. The outliers in terms of special quality casks must be terrific. If the barrel selection is there - maybe we'll get some in this single barrel version. Hopefully. Then it would the the cheapest ultra-premium bourbon. The real question to me is where will this stuff sit versus the Kentucky Spirit (which is 101 proof)? Any idea if there will be barrel info on the bottles? One thing that's always bothered me about Eagle Rare and Elmer T. Lee is that they're nominally 'single barrel' bourbons, but there's no way to know when you're getting a bottle from a different barrel. Kind of defeats the purpose in my mind. I love that you posted the COLA. The reverse label makes it clear that it's a single barrel item. But, sure enough, no barrel #, rick # or warehouse # in evidence. Apparently we are not to know... I agree that's a shame. I'm cautiously looking forward to the SB as well. Any idea what differences we should expect between this and the (on paper) apparently similar Rare Breed? Both seem like NAS Barrel proof WT. I would only be speculating. The hope is that the difference is analogous to the difference between regular Wild Turkey 101 and Wild Turkey Kentucky Spirit which are the same proof and the same production runs - but are special barrel selections. I have had some absolutely terrific bottles of Kentucky Spirit. I'm hoping that barrel selection magic is working here. If so, this Russel's Reserve Single Barrel stuff could be stunning - with big flavor density. It will almost certainly have the same spicy high rye fruity musty tangy peppery thing as Rare Breed - but with considerably more density of flavor and a more regal presentation because it hasn't been barrel averaged, chill filtered, and otherwise messed with. Wha? NO WAY! OMG - You are 100% right. Plain as day the label reads "Small Batch Single Barrel". Like saying "lovingly handmade by advanced computerized manufacturing robots" or "military intelligence"... What in the world are they saying "small batch" for when they are saying "single barrel". Don't they know that these are two MUTUALLY EXCLUSIVE terms? Propeller driven ramjet... turbo charged electric car... I'm speechless! FYI - the press release clearly describes this as a single barrel product (and the official name of the product is "single barrel"). Here's a snip: “This is Bourbon at its best,” declares Jimmy Russell, Master Distiller. 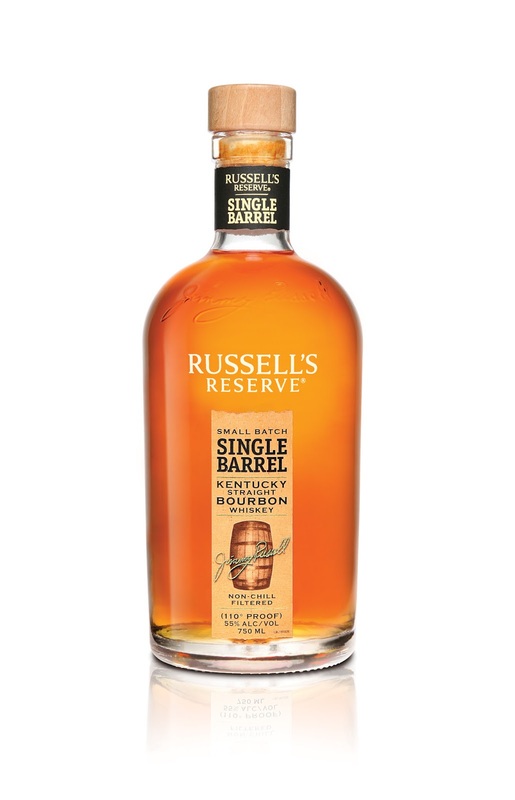 “What is incredibly special about the Russell’s Reserve Single Barrel is that each barrel has its own personality, but still captures the rich, creamy toffee vanilla style of Russell’s Reserve." Maybe the Continental philosophers of Gruppo Campari have concluded that the essence of "small batch" lies in the "small" rather than the "batch." I for one will be pondering the possibility of a "small batch, zero barrel" bourbon this evening. I hope that remark wasn't a broad sided slam against all marketing people. ;) some of us just like to make pretty things and it was the only way that could be found to get paid to do it. That said...you're probably right. Lol. I used to do marketing myself, Eric. I'm well aware that sometimes you have to do punchy writing about a topic you don't know enough about. How else can you explain "Small Batch Single Barrel"? Wild Turkey has had high-end products in the past, but they are mostly one-offs like Tradition and Tribute or limited runs like American Spirit. Also in its day WT 12 y/o definately qualified as high end. Now, I'm afraid, they have been vicitims of poor planning by Continentals and . Hopefully things will get better soon now that bottling is coming back to Lawrenceburg and the new still and warehouses are coming into service. My point, I guess, is that I am cautiously optimistic about the new RR Barrel strength. Still seems like it might be better to work on strengthening their current products rather than coming out with new "small batch single barrel" products. Danielle from Exposure had this to add - presumably from the Nichols or maybe the Campari people: "I just wanted to take a moment and clarify something for you. The reason that each bottle of Russell's Reserve says small batch (including 10yo bourbon and 6yo rye and Single Barrel) is because the whiskey itself is carefully selected by Jimmy and Eddie Russell in small batches at a time. This is their definition of Small Batch. It seems that other brands have their own definition of this term and it can vary from brand to brand. Hope that helps in some way!!" This is a completely unique definition of the term as far as I know. My post before this "Musing on Small Batch Bourbons..." tracks a bit of the history of the term and it's all about dumping a limited (and not specified) number of barrels into a marrying tun and then bottling the resulting batch. But that's, apparently, where they're coming from. Thanks for taking the time to respond, Danielle!